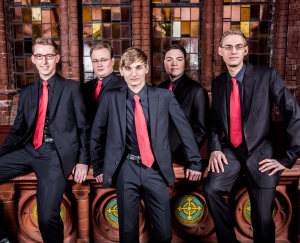 As part of our Reformation 500 Commemoration, the Ensembles Nobiles, a male vocal quintet from Leipzig, Germany, will be singing for of our 11 am Worship Service Sunday, Oct. 8, 2017. Founded in January 2006, the choristers met each other during their nine-year education in fine arts as members of the St. Thomas Boys Choir in Leipzig, Germany, where Johann Sebastien Bach was once the Cantor of the Thomas School. The Ensemble Nobiles serve as the official ambassador of the ‘Forum Thomanum‘ (faith, singing, learning) education campus for St Thomas Boys Choir Leipzig. Their repertoire ranges from late medieval mass songs to modern age works. The five young musicians attach great importance to the works of German Romantic composers, such as Schubert, Schumann and Mendelssohn, as well as to their extensive repertoire of church music. In addition to several performances in Germany, like the renowned Bachfest Leipzig and Schleswig-Holstein Musikfestival, the ensemble has also performed in Australia, New Zealand, Singapore, Switzerland, France, Italy, Norway, Slovenia and the Netherlands. The Ensemble Nobiles will also be featured throughout the upcoming play, “In God’s Own Country”, which begins at the Meroney Theater on October 12, 2017 and continues through Saturday, Oct. 21.